After seeing some of the yarn wrapped crafts from School Time Snippets, I fell in love with the technique. I also figured that they would work well for our space theme by making some planets. So when K had an impromptu nap on the couch, I quickly grabbed all the materials that J and I would need to make some yarn wrapped planets. And to be honest, I am absolutely thrilled with how cool they turned out to be. Dare I say they are out of this world? Yes, I know...bad cliche. Regardless, these yarn wrapped planets make a great fine motor craft for kids. Anyway, I grabbed some cardboard and cut out the rough shapes and sizes of the planets. Please note, they are not to scale. I eyeballed the sizes. I then cut slits all around the planets to help keep the yarn in place. My mom brought up two bags filled with yarn for me a few months ago and luckily, there happened to be all the right colors in the bags to make these planets. I placed the coordinating yarn next to each planet to make it easier for J to make the planets. However, I did not anticipate how much J would struggle with this activity. His fine motor skills are pretty good, but for some reason, he found this craft challenging. He climbed onto my lap and we worked on the planets together until he got the hang of things. By the time J got to Mars, he was starting to figure it out. Wrap and pull, wrap and pull, wrap and pull...I kept chanting that to help keep J focused on the technique. Saturn's rings added another challenge, but he eventually did it. Every time he finished a planet, we would place it in the correct order and say the planets' names together. A few days later and he can still rattle off the names of some of the planets and point to the correct one. I'm impressed with what J remembered from this activity! And the end results are totally fabulous! How awesome did these yarn wrapped planets turn out?! 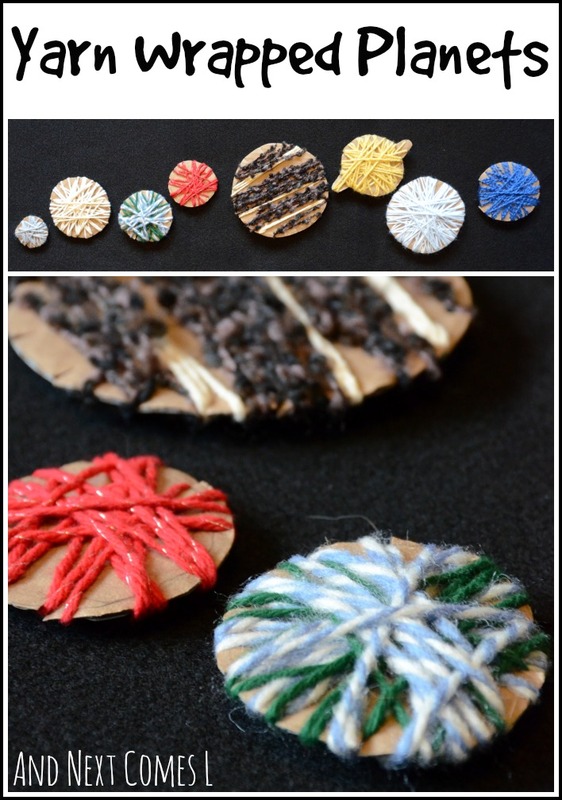 If you're looking for more fine motor fun, be sure to check the others posts in this week's Fine Motor Fridays series. I'm pretty much obsessed with these! Love them! Me too, Blayne! I think they are crazy cool! I agree.. they are out of this world ; ) Beautiful job-- the yarn colors were perfect, too! Thank you, Kristina! And yay! You share my enthusiasm for the bad cliché! This is such a cool idea! I just love it! That's so sweet! Thank you.